Less than 17,500 part 1 | What Car? 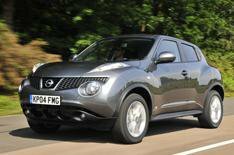 If the Qashqai is the sensible member of the Nissan crossover family, then the Juke is the young rascal, and is all the more loveable for it. From its bug-eyed looks to its 188bhp turbocharged engine, this tiny tearaway screams attitude. Like it or not, the Jukes styling is one-of-a-kind, blending coup and 4x4 elements to create something fresh and youthful. The innovation continues inside, with a centre console inspired by a motorcycles fuel tank. Its funky. If youve got an eye on cost, other Juke models (such as the 13k 1.6 Visia) make more sense, but if its thrills youre after, it has to be the 1.6 DIG-T.
Its an absolute riot, delivering so much mid-range shove that its easy to make the front tyres scrabble for traction. Responsive, well-weighted steering keeps you fully in control, though, and theres plenty of grip through the bends. Fun has been part of every Minis appeal since the first model rolled off the production line back in 1959. BMW has kept the fun coming with its take on the original car, and thats especially true of the Convertible, which adds an extra element of wind-in-the-hair motoring. Its perfect for a top-down, country lane blast. Some cars take more easily than others to having their roof chopped off, and the Mini is one. Visually, it just works, thanks to its simple lines and neat, retro details. Inevitably, the reduced body stiffness means the Convertible isnt as sharp to drive as the hatch, but thats like saying bungee jumping isnt quite as much fun as skydiving. The Cooper version also has a peppy engine and fixed roof or not the Mini has better handling and steering than many other cars at this price. To top it off, the Minis premium image means strong residual values, so youll still have a smile on your face when its time to trade yours in. The Fiat 500 is perfect for the sort of person who wants to fall in love with their car. Perhaps even give it a name. The infatuation wont dim one iota when youre behind the wheel, either. The 1.2-litre petrol engine is our pick: theres enough get-up-and-go to deal with the cut-and-thrust of traffic, and itll drink very little fuel along the way. Youll be able to ignore the so-so handling and limited boot space because youll be too busy enjoying the chic interior style and light steering and gearshift. The 500 feels like a quality item thats been well screwed together, and the entry-level Pop model is cheap enough to be a bargain, and comes with front and side airbags and Bluetooth as standard. Air-con is an option, though. So dont just stare lovingly at it: get out there and drive it: its fun. Yes, you really can have a proper British sports car for the same price as a Ford Fiesta. There is one drawback, though: youll need to build it yourself. However, the chaps at Caterham will deliver one ready-assembled for an extra 3000. Either way, the 7 is stunningly entertaining. The 1.6 Classic might deliver only 120bhp, but its so light that its faster than most hot hatches, and it feels even quicker because your backside is practically rubbing along the Tarmac. Turn the wheel and the steering is wonderfully accurate and full of feedback. True, the 7 is also impractical, unrefined and you wouldnt want to crash in it, but you wont mind any of that when youre barrelling down a favourite B-road. The Mini's status as the go-to hatchback for those looking for something stylish and sporty went unchallenged for years. Then along came Citron with what it promised was a serious rival: the stunning DS3. With its low-slung body, sharks fin central pillars and wealth of quirky touches, the DS3 provides a more modern, but equally striking, alternative to the Minis retro charms. The DS3 matches the Mini for individuality, too, with a variety of colour schemes. Inside, its as classy as any car in its class. That would count for little if the DS3 wasnt fun to drive. Thankfully it is. Our favourite version is powered by a detuned Mini Cooper S engine, which is punchy and flexible. There are also bags of grip, and while the steering isnt as communicative as a Minis, it weights up nicely.